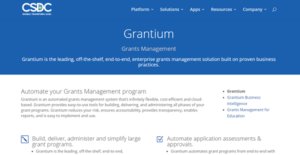 Cloud-deployed grant management platform Granium is designed to manage all processes associated with grant programs. It is a flexible system that comes with all the necessary tools to build, deliver and administer the different stages of any grant program. The platform has a wide array of easy-to-use integrated solutions that are built on renowned business practices. These are all intended for building, delivering, and administering the different phases of an organization’s grant program. It is designed to help businesses avoid risks, uphold accountability, prioritize transparency, enable reports, and implement programs without any hassles. Grantium is a product of CSDC Inc., which offer industry-grade solutions that can manage all types of compliance, from Permitting, Licensing, Code Compliance, Public Safety, Public Health, Environment Safety, Vehicle Safety, Tax Compliance, Freedom of Information Compliance, Legal Compliance and Courts Automation. Grantium is designed to aid enterprises in building, delivering, and administering large grant programs. The end-to-end platform is built on proven business practices that are flexible and cost-efficient. Advanced yet easy-to-use tools help facilitate large and multiple grants programs with speed, confidence, and efficiency. Grantium empowers users to manage grants efficiently and comply with government regulations. The software platform fits to every user’s requirements and ensures your programs are 100% transparent and accountable. Furthermore, Grantium sees to it that programs are accessible, free of undue complexity, fair to applicants and administered with maximum efficiency and complete control. Grantium automates grant programs from end-to-end with CSDC’s unique Grantium 8A’s methodology. It boasts of a best practices delivery model for Commercial Off-the-Shelf [COTS] Grants program platform. Using a step-by-step, iterative process, the 8A’s provide a common language and approach to enterprise grants management projects. As a result, organizations significantly reduce time and costs for managing grants. With Grantium, users can account and report on every aspect that is received and spent in the system. One can monitor every stage – from application to close-out – in full detail. The software is currently deployed in complex granting environments in the US and Canada, thus having a proven track record in grants management. If you are interested in Grantium it could also be beneficial to check out other subcategories of Best Grant Management Software listed in our base of SaaS software reviews. Every enterprise is different, and might need a special Grant Management Software solution that will be fit for their business size, type of customers and staff and even individual niche they cater to. We advise you don't count on locating an ideal services that is going to work for each company no matter what their background is. It may be a good idea to read a few Grantium reviews first and even then you should pay attention to what the service is supposed to do for your business and your workers. Do you require a simple and straightforward app with only basic functions? Will you actually make use of the complex tools required by experts and large enterprises? Are there any particular features that are especially practical for the industry you operate in? If you ask yourself these questions it is going to be much easier to get a trustworthy service that will fit your budget. How Much Does Grantium Cost? We realize that when you make a decision to buy Grant Management Software it’s important not only to see how experts evaluate it in their reviews, but also to find out if the real people and companies that buy it are actually satisfied with the product. That’s why we’ve created our behavior-based Customer Satisfaction Algorithm™ that gathers customer reviews, comments and Grantium reviews across a wide range of social media sites. The data is then presented in an easy to digest form showing how many people had positive and negative experience with Grantium. With that information at hand you should be equipped to make an informed buying decision that you won’t regret. What are Grantium pricing details? What integrations are available for Grantium? If you need more information about Grantium or you simply have a question let us know what you need and we’ll forward your request directly to the vendor.